Frames – Back then, homeowners had to choose between wood or vinyl. Wood is known for its strength and beauty, but not so much for its inherent vulnerability to external temperature changes and moisture. Vinyl, on the other h and, is a great choice for its low-maintenance benefits and relatively low cost. However, it lacks structural integrity. Windows from Renewal by Andersen® come with our Fibrex® material frame. This combines the benefits of both wood and vinyl frames thanks to the polymer and wood fiber composition. Glass – A dual-glazed design is essential to overcoming glass’s naturally conductive properties. The sealed airspace formed by the two panes prevent heat transfer. Our dual-pane High-Performance™ Low-E4® glass options prevent heat from escaping during cold season and from getting in during hot days. The Low-E coatings also filter solar heat, letting you enjoy natural light without worrying about heating up your indoors. Design – Strong and energy efficient windows must also be customizable. This is why we offer several customization options such as grilles, hardware, and finishes that will suit every style and taste. 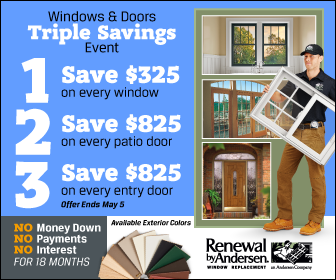 At Renewal by Andersen, we build each window to fit, which leaves the original walls and structure unharmed. It also guarantees a perfect fit for maximum energy efficiency. Installation – Even the best replacement windows wouldn’t perform as expected, which is why we regard installation as a key component of our start-to-finish process. Our installation team delivers our quality of promise. Every home is different, and each member of our installation team has proper training to h andle any installation situation. From traditional casement windows to modern picture units, you can rely on Renewal by Andersen of St. Louis for quality products and services. We also offer strong warranties to cover your products for years. We serve different areas in MO, including St. Charles, Missouri. Call us today at (314) 332-2364 or fill out our contact form for a free in-home estimate.